Magnets adhere to the tins. As pictured a set of 4 cans with lids, each has a capacity of 16 oz. These are seamless stackable aluminum tins of high quality, Made in New Jersey, USA. Great for spices, candles, tobacco, and any other commodity. You'll love the look & feel of these top qop quality, NEW. 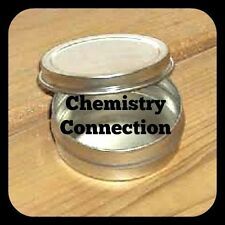 5 Oz shallow tin lip balm, makeup, or or holders for all kinds of stuff! With lids. Seamless tin with rolled edges. Great add on! Take a look at out other products to make you own cool bath & body line. SET, BOTTLES, SPRAYERS. No more wasting a product bottle at shows, use them to sample your products. SILVER SPRAYER, BENT, 2 1/16" DT. GLASS CYLINDER INSIDE. This mister has an easy to apply threaded sprayer top. .25 oz Lip Slide Tin Set. Bag of 25 SETS (lids and bottoms). Shrink Wrap Bands 40x40 (will fit the tins). They are designed for oil and wax based products. They will rust when used with water based products. 8 tins per order. Tin plate, seamless construction. Snug fitting, slip-on lids. Contains 6 -- 1oz/ 30g containers. Easy to decorate and personalize outer lid with round hole punch. Shallow, seamless, tin plated steel containers with slip on covers. These tins stand out from the crowd with a modern, minimalist design, gently curved bottom and white color. Tins are empty and undecorated. Photo of candle tin and candy-filled tins are for example and demo purposes only. The 30WFS5 is a 4 oz. clear french square glass jar with a 43mm (43-485) neck size. This jar has a distinctive rectangular profile, a great choice for unique bottling. It is also applicable for use across industries. Tins have rolled edges. As always, be sure to test these tins with your products for compatibility. MADE IN THE USA - Popular for candles, spices, beads or just as a great small storage solution. They are seamless so they will not leak and they can be easily decorated with ribbon or labels to really dress your product up for resale! 24/410 is the size of the neck of the bottle it will fit. Bag of 50 Sprayers w/hoods (no bottles). Jars Tins Sets ( Top and Bottoms). SET, TINS/ LIDS, SHALLOW, SEAMLESS, Seamless Tins with Rolled Edges. Embossed Lid. 1/2 oz Flat Tin Set. New - BATH & BODY SUPPLIES. Lid Provided with Set. Suggested Shrink Wrap Size: 65x55. 2 Oz of Palm Kernel Oil. You'll love the look & feel of these top qop quality, NEW. 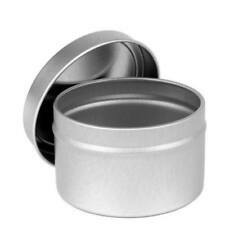 5 Oz shallow tin lip balm, makeup, or or holders for all kinds of stuff! With lids. Make your own Lip balm. It's easy, and so affordable! Tin is 1.75" wide x 2.5" high with Slip Cover Top. Great for Tea! Tin plate. Seamless construction. Capacity: 4 oz. Snug fitting, slip-on lids. 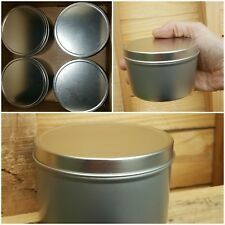 Six (6) candle tins 6oz size suitable for all types of wax: Paraffin, Soy, Beeswax, Coconut etc. New with lids as shown. These slip cover tins are perfect for any crafting projects you may have! Whether you are making lip balm, lotions, candles, or you are using it for food products, these tins are perfect for you. These high quality durable tins are manufactured with a safe edge and have a slightly embossed top for application of labels. 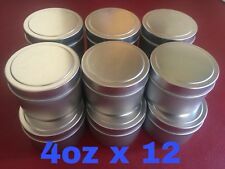 Twelve (12) candle tins 6oz size suitable for all types of wax: Paraffin, Soy, Beeswax, Coconut etc. New with lids as shown. Highlighting the family centre piece. - Material: Foil Paper. 300 x Gold Leaf. - Looks and feels like genuine gold leaf. - Color: Golden, Green, Red, Purple, Sapphire and Rose Pink. - Add luxury and shiny effect to enhance house decor. .25 oz Lip Slide Tin Set. New - BATH & BODY SUPPLIES. Bag of 100 SETS (lids and bottoms). Bag of 100 sets. Shrink Wrap Bands 40x40 (will fit the tins). They are designed for oil and wax based products.